10 A None No Power Seat 10 A is a standard flat bed Business Class seat. 10 D None No Power Seat 10 D is a standard flat bed Business Class seat. 10 H None No Power Seat 10 H is a standard flat bed Business Class seat. 10 L None No Power Seat 10 L is a standard flat bed Business Class seat. 2 A None No Power Seat 2 A is a standard flat bed Business Class seat. 21 D None No Power Seat 21 D is a standard Economy Comfort seat that has extra legroom due to the position of the bulkhead however, the bassinets in front may be bothersome. The tray table and personal TV are in the armrest, reducing seat width and making the armrest immovable. There is no floor storage during take-off and landing. 21 E None No Power Seat 21 E is a standard Economy Comfort seat that has extra legroom due to the position of the bulkhead however, the bassinets in front may be bothersome. 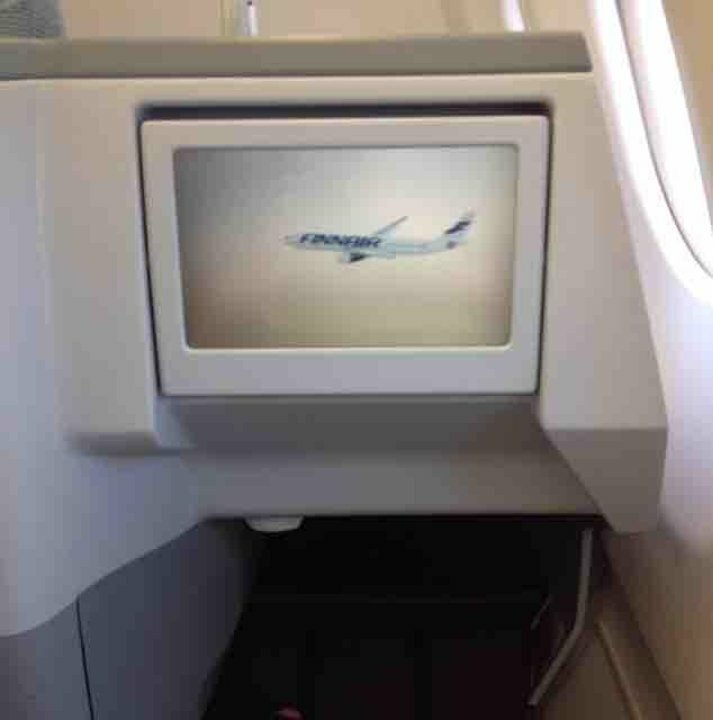 The tray table and personal TV are in the armrest, reducing seat width and making the armrest immovable. There is no floor storage during take-off and landing. 21 G None No Power Seat 21 G is a standard Economy Comfort seat that has extra legroom due to the position of the bulkhead however, the bassinets in front may be bothersome. The tray table and personal TV are in the armrest, reducing seat width and making the armrest immovable. There is no floor storage during take-off and landing. 21 H None No Power Seat 21 H is a standard Economy Comfort seat that has extra legroom due to the position of the bulkhead however, the bassinets in front may be bothersome. The tray table and personal TV are in the armrest, reducing seat width and making the armrest immovable. There is no floor storage during take-off and landing. 31 C None No Power Seat 31 C is a standard Economy Class seat, although close proximity to the lavatories may be bothersome. 31 D None No Power Seat 31 D may have limited recline due to the wall behind. The proximity of the lavatories may be bothersome. 31 E None No Power Seat 31 E may have limited recline due to the wall behind. The proximity of the lavatories may be bothersome. 31 G None No Power Seat 31 G may have limited recline due to the wall behind. The proximity of the lavatories may be bothersome. 31 H None No Power Seat 31 H may have limited recline due to the wall behind. The proximity of the lavatories may be bothersome. 31 J None No Power Seat 31 J may have limited recline due to the wall behind. The proximity of the lavatories may be bothersome. 31 L None No Power Seat 31 L may have limited recline due to the wall behind. The proximity of the lavatories may be bothersome. 32 A None No Power Seat 32 A may have limited recline due to the wall behind. The proximity of the lavatories may be bothersome. 32 C None No Power Seat 32 C may have limited recline due to the wall behind. The proximity of the lavatories may be bothersome. 4 A None No Power Seat 4 A is a standard flat bed Business Class seat. 41 G None No Power Seat 41 G has some extra legroom due to the exit row in front. The tray table and personal TV is in the armrest reducing seat width. There is no floor storage during take-off and landing. Proximity to the lavatories may be bothersome. 6 A None No Power Seat 6 A is a standard flat bed Business Class seat. 8 A None No Power Seat 8 A is a flat bed Business Class seat. Proximity to the lavatory and galley may be bothersome. There is no floor storage during take-off and landing. 8 D None No Power Seat 8 D is a flat bed Business Class seat. Proximity to the lavatory and galley may be bothersome. There is no floor storage during take-off and landing. 8 H None No Power Seat 8 H is a flat bed Business Class seat. Proximity to the lavatory and galley may be bothersome. There is no floor storage during take-off and landing. 8 L None No Power Seat 8 L is a flat bed Business Class seat. Proximity to the lavatory and galley may be bothersome. There is no floor storage during take-off and landing. 9 A None No Power Seat 9 A is a standard flat bed Business Class seat. 9 C None No Power Seat 9 C is a standard flat bed Business Class seat. 9 D None No Power Seat 9 D is a standard flat bed Business Class seat. 9 H None No Power Seat 9 H is a standard flat bed Business Class seat. 9 L None No Power Seat 9 L is a standard flat bed Business Class seat. EEach seat is equipped with AVOD (Audio Video on Demand) with a large selection of movies, television, games and other programming. Headsets are complimentary on all scheduled long-haul flights but a fee is charged for leisure or charter. On leisure or charter flights, Finnair charges per flight for access to the entertainment system. For more information about the music and film selections, see the Finnair Entertainment brochure. 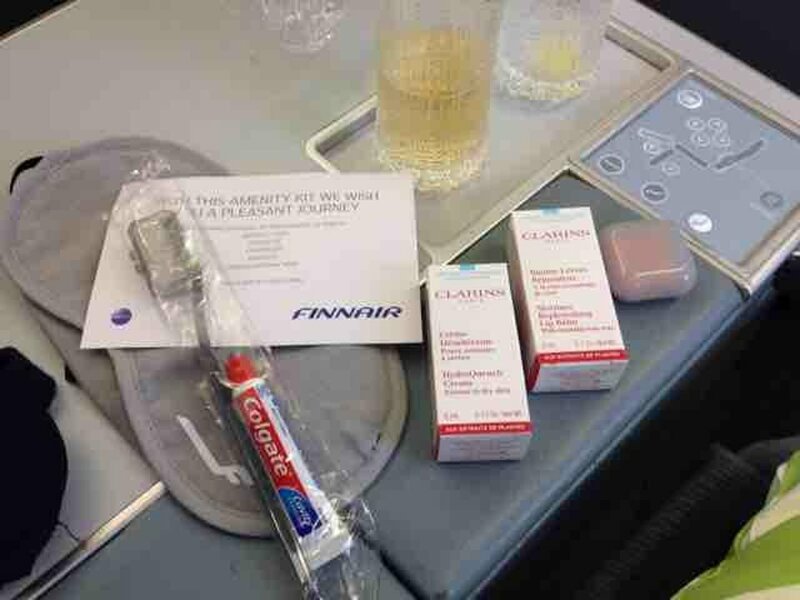 This Version 2 operates in a two class configuration and shows Finnair's newest Business Class which is a staggered layout. 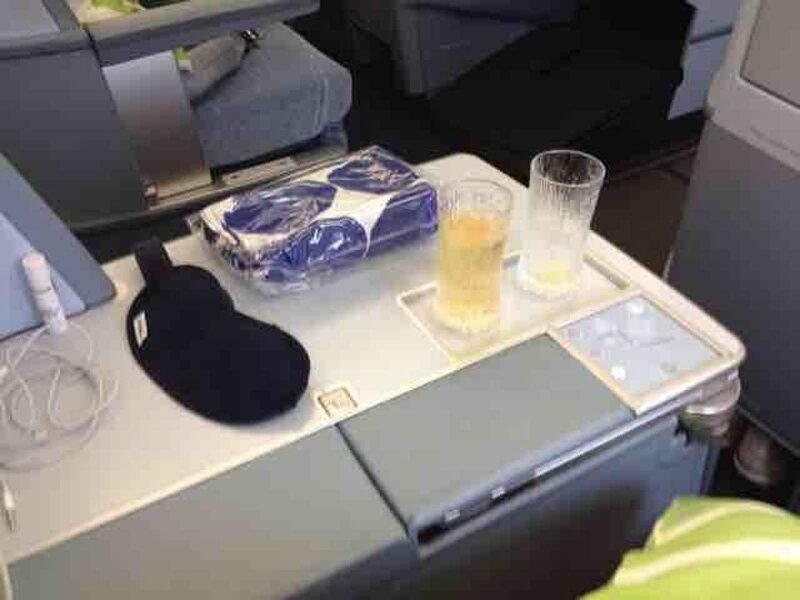 In this version, there is additional capacity in Business Class which is split over two sections. Business Class are rows 1-10, Economy Comfort are rows 21-25 and Economy is rows 26-57 for reference when discerning different versions of this aircraft. Im 1.91cm and the room for the feet when lying flat is very small. There is no room for bending knees. Its nice to be in the last row on business, there is no traffic passing by on the way to the toilet. Overall an ok seat. As an Economy seat, this has just enough space for 6'2" tall with long feet. When traveling with child (8 year old) in next seat, this is just fine. Finnair A330 is already old plane, so the entertainment system is not the best possible and it has some malfunctions (audio might not work, console might not work) but pleasant staff will try to help you out. In all, long flights are not that terrible in this seat. In 59 years of flying I think this is the worst seat ever. 10 &1/2 hours in an undersized seat. Two in-arm fold out eating trays on either side made the seat narrower than all other seats. diagonal to video screen. Person behind was so close that when I tried to put the seat back even a little it cramped them and they just pushed my seat forward until I was back to vertical. TERRIBLE FLIGHT! Amazing. Great legroom. Toilets a bit annoying, but amazing. Limited recline, but better service in the back. Beware! This is a "window seat" without a window. There is a blank wall between the window in front and in back. It's impossible to see out. This seat is much closer to the bulkhead compared to other seats of this class! One of the best seats in this plane. It's the throne seat. Was able to get a good night's sleep. Power outlet was a little "iffie" throughout the flight. Everything else was perfect. The recline was OK as there is enough space to the wall behind, but there is a base of the row in front in the middle of your leg and storage space. 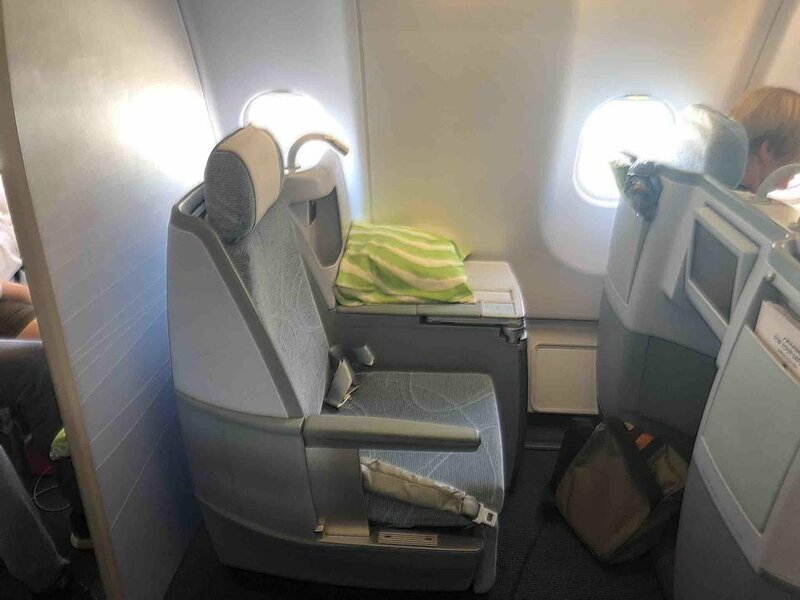 row 8 seats offer considerably more space for the feet - rows 9&10 and probably all other non bulkhead business class seats have such a small cutout that any person with shoe size 9 or more cannot use the last 15 cm of the bed while on their back. Flew this from HEL-ORD, 21C was a great seat for extra legroom. Seat was noticeably tighter though, as the tray table and remote comtrol was tucked into armrest. Close to the business class cabin so nobody was lingering around waiting for the bathrooms. Good for tall people, but bad for wide hipped people. Note that from the window seats on the port side, the ones which have two seats, have no access to the aisle unless the person next to you fully retracts their seat. This can be bothersome, especially on long flights if the aisle passenger is sleeping. This and 8L are the best seats in Business class. The Small business cabin has close to no traffic to the toilet, so it does not bother at all. The leg- and armspace is the best you get. You don't cram your feet in between the seats in front of you. You rather have a large opening. The aisle on the left hand side is very narrow which means you get constantly bumped as people walk by. I know I've just used it!